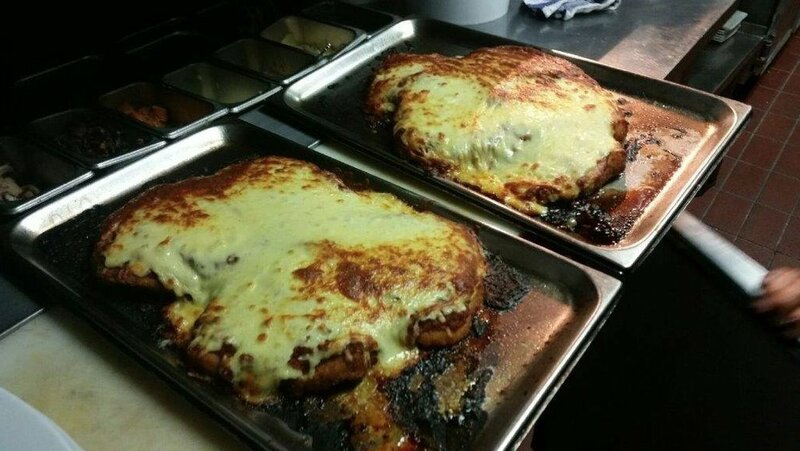 The challenge was the same as last time - Finish off a 1.5kg parma, chips and a pint as quick as you can. The top times then get invited back to compete in the finals, and the winner of the finals takes home a trophy, a spot in the record books and a year's worth of free parmas. After my miserable performance at the last challenge I decided to sit on the sidelines and participate in this year's challenge purely as a spectator/reporter, as I don't think my stomach (or waistline) could take that much punishment again. The finals were on Sunday so we headed down to watch the action unfold. Some impressive times on the board, especially when you see the size of the thing. We grabbed a beer and milled around, waiting for the contestants to arrive - there were originally meant to be six competitors, but unfortunately three didn't arrive. Luckily the three that did arrive were the ones that had the top three times on the leaderboard - So the wheat had been separated from the chaff, and this would truly be a fight of the best of the best. The choice between beer and soft drink was given, and they were told that everything on the plate was to be finished, Including the ice in the glass for those who opted for soft drink over beer. Things were pretty even for the first minute, there seemed to be minimal mouth burns, as was a problem of the 2013 finals. After a few minutes, however, it became pretty clear that (unless there was a massive comeback in the books) that Jamie (on the far left in the red shirt) was going to be our champion of the day. He absolutely smashed it, and as the other competitors looked like they had boarded a train to Struggletown, Jamie was still going strong. 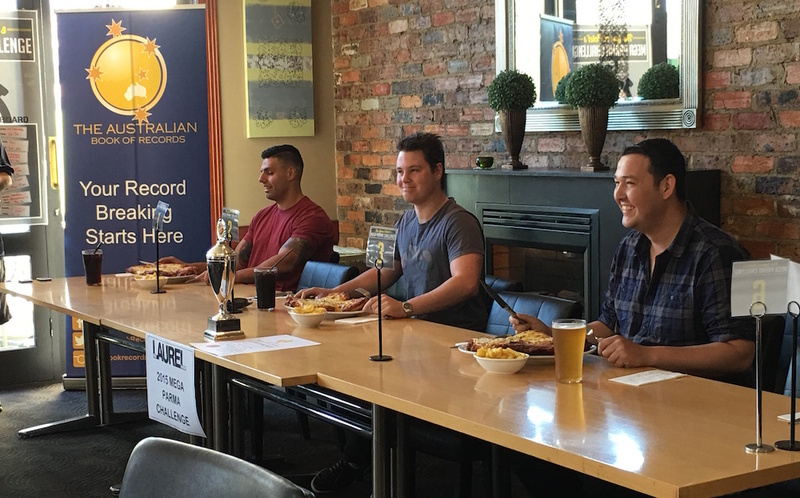 He demolished the parma, seemed to be filling up on the chips and struggled through the coke to be crowned the champion of the day and inducted into the Australian Book of Records. Congratulations Jamie, You killed it - Also a big kudos to the other two contestants, it was an impressive feat just to be sitting at the table on Sunday (Something I couldn't even accomplish if I tried ... and I did). 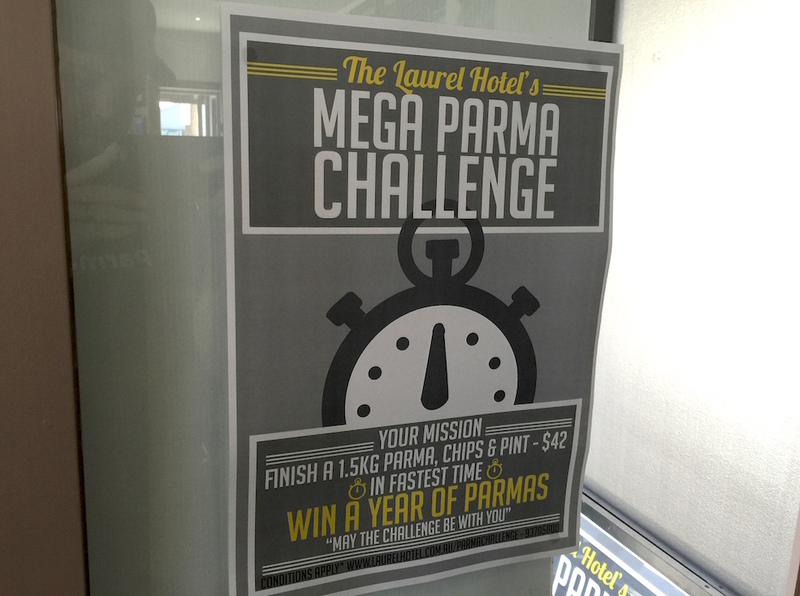 With a little luck the Laurel won't be skipping a year and we'll hear from them again at the Mega Parma Challenge 2016, and hopefully Jamie will make another appearance to defend his title.